Richmond, B.C. 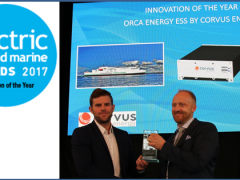 – June 23, 2016 – Corvus Energy has been awarded ‘Supplier of the Year’ at the 2016 Electric & Hybrid Marine Awards being held at the Electric & Hybrid Marine World Expo in Amsterdam. This is the second consecutive year that Corvus has received this award which is decided up on by a panel of highly regarded industry experts. Following the successful launch of Orca ESS, Corvus also announced 2 new projects this week that will utilize Orca Energy ESS. “It’s been another banner year for Corvus Energy. It’s hard to find a hybrid or electric marine power project that they don’t have a hand in” says John Snyder, editor-in-chief and publisher, Marine Log – and awards panel judge. Corvus Energy has deployed more ESS solutions into maritime applications than anyone else in the industry. With 50+ vessels and over 35MWh installed, Corvus has unsurpassed experience and knowledge that enables revolutionary innovation. As recognized by another panel judge, “This company is a perfect example of successfully implementing innovations on a large scale” – Charles van den Oosterkamp, CEO, Yellow & Finch Publishers. Corvus believes that lithium-ion based energy storage systems have a broader range of applications, within the maritime industry and beyond. The extensible platform which forms the basis of the Orca product line enables us to meet those requirements well into the future. Sam Chambers, editorial director, Asia Shipping Media & panel judge added, “Corvus is consistent, whatever the market”. The Orca ESS product line was specifically designed and built to meet the needs of maritime applications at the industry’s highest levels of performance and safety, while making economic sense to ship owners and builders. Rather than a single product approach, the Orca ESS product line delivers a range of products which are designed to meet the various needs of maritime customers. Orca Energy is ideal for applications that require large amounts of energy such as ferries and merchant vessels, while Orca Power was designed for applications that require a seamless response to dynamic power loads such as offshore supply vessels and port equipment. With the industry’s highest C-Rates, unparalleled density and increased lifespan, Orca ESS solutions are designed to scale for applications of all sizes, up to and beyond 10MWh, at a lower total cost of ownership. In addition to the superior performance and economic advantages, the purpose-built Orca product line also includes industry leading innovations related to safety and operations. Among those innovations, both Orca Energy and Orca Power feature patented-pending technology that delivers cell-level thermal runaway isolation. 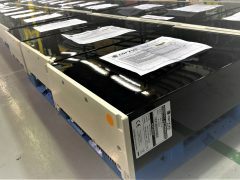 This unprecedented level of safety is standard across the Orca ESS product line and does not require active cooling techniques, such as liquid cooling for it to be effective. Additional innovations such as ‘blind-mate’ power connections contained within the rack, eliminate the need for cables and manual connections resulting in enhanced reliability, increased safety and reduced installation costs.